Emerald Bay, Lake Tahoe. Charles Webber © California Academy of Sciences. Conservationist John Muir dubbed the Sierra Nevada the "Range of Light" because of the way sunlight glinted off its glacier-polished cliffs. However else the Sierra may shine, it boasts the world’s largest trees (giant sequoia), as well as California’s biggest roadless areas, world-class national parks and vast forests, protected and not. The Sierra bioregion is biologically complex. 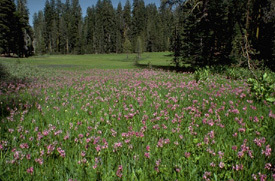 It contains more than half of the plant species found in California. Habitat types include annual grassland, blue oak savanna, chaparral, ponderosa pine, black oak woodland, mixed conifer, red fir, riparian, alpine meadow, Jeffrey pine, sagebrush, and bitter brush. The climate in this bioregion varies with the elevation. The higher elevations offer cold, snowy winters and cool summers, while the foothills experience rainy winters and mild summers. Summers are dry. The snowfall in the northern Sierra is crucial to California’s water supply because the spring snowmelt feeds the state’s reservoirs. When the summer temperature rises and strong winds blow, wildfires frequently ignite. This vast and rugged mountainous bioregion spills into Nevada, with which it shares Lake Tahoe. Named for the Sierra Nevada mountain range that it encompasses, the region includes forests, lakes and rivers that generate much of the state’s water supply. The region boasts eight national forests: the Plumas, Tahoe, Eldorado, Stanislaus, Sierra, Inyo, Sequoia and part of Lassen, which it shares with the Modoc bioregion. The U.S. Forest Service also oversees the awkwardly named "Tahoe Basin Management Unit," formed to protect the watershed systems forming the basin that surrounds the lake. The crown jewel of California’s national parks, Yosemite, belongs to the Sierra region, as do Sequoia and Kings Canyon national parks. The Sierra encompasses 18 federally designated wilderness areas, the Ansel Adams, John Muir and Desolation among the most well-known. This area is rich in biodiversity, with about two-thirds of the state’s birds and mammals and one-half of its reptiles and amphibians calling the area home. Among these are the mountain king snake, lodgepole chipmunk, mountain beaver, California mule deer, and mountain lion. The mountain chickadee, pine grosbeak, California spotted owl, and mountain quail are a sampling of the birds that can be found in the region. The California golden trout, the state fish, is a native of the southern part of the Sierra bioregion. Rare species: Black bear, Pacific fisher, northern goshawk. Threatened and endangered species: Wolverine, California bighorn sheep, willow flycatcher, bald eagle, and great grey owl. Logging– Well over half of California’s productive forestlands are located in its national forests, with most of these federal tracts in the Sierra. As a result, the Sierra bioregion’s watersheds have been hammered relentlessly by Big Timber since the end of World War II. Only in recent years have long-overdue environmental safeguards– coupled with over-harvesting– begun to reduce the volume of timber produced here. At the same time, and not coincidentally, the region’s economy has shifted from timber extraction to the much-more-lucrative recreation and tourism industries as Californians throng to the area’s environmental quality. But in recent years Sierra Pacific Industries, the nation’s largest timber company by acreage owned, has steadily bought up forestlands in the region. That company’s harvesting method of choice is clear-cutting and it plans to level upwards of one million acres in the Sierra in the coming decades. 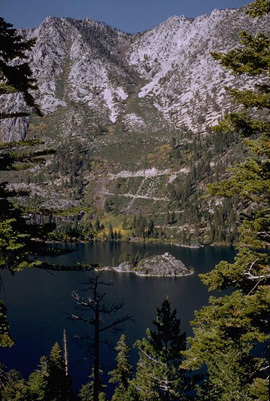 In 2001 the U.S. Forest Service released the Sierra Nevada Framework, a management plan for the Sierra that environmentalists heralded for protecting old growth and laying the groundwork for watershed restoration. Now the Bush administration is recommending significant changes to the plan that would triple the level of logging allowed under the Framework. For more information, click here. Development– As one example of the development encroaching upon the Sierra, six new golf courses are currently planned across the foothills of Tuolumne and Calaveras counties, threatening habitat loss for wildlife species.